The road bikes on offer from Red Kite Cycles are unparalleled. Browse the bikes to see the state-of-the-art in both aluminium and carbon road. If you are after affordable quality to take you the distance, then look no further than Domane AL2, AL3, AL4 and AL5. We follow up with more in the Emonda ALR range before getting amongst some of the most exciting carbon fibre bikes available. For endurance riders there is the unparalleled Domane with its ISO-Speed decoupling for comfort – the bike comes in both rim and disc brake versions. Then we see the fantastic Emonda range giving pace, swift handling and class-leading lightness; again in rim or disc brake versions. At the pinnacle of outright speed is the Madone: this is an aero feast of dynamic handling and breathtaking looks. Elsewhere in Road Bikes you will find touring and gravel bikes … because they too just love eating up those road miles. 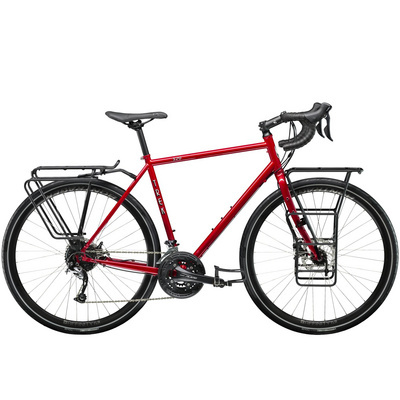 Here online you will see everything we sell from Trek, but this is backed up in store with even bigger choice from Enigma and Bullfinch Cycles.